Two more events at SQIFF 2018 have been announced and are on sale now! 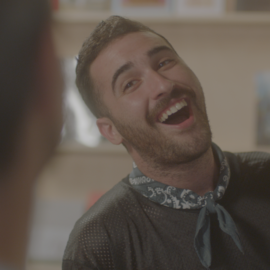 The Queer Film Network’s Gay As In Hysterically Funny UK tour is part of the BFI’s Comedy Genius season. What does it mean to make fun of yourself and your community as an LGBTQ+ person? A special programme of SQIFF Shorts on 9 December examines queerness and onscreen comedy, including short films by Raymond Yeung, Jordan Firstman, and Alli Logout, and episodes from Ingrid Jungermann’s classic webseries, F to 7th. Featuring self-loathing and loathable gay men, butch lesbians in denials, and queer femmes in their own carefree universe. The screening is followed by a panel discussion on queerness and comedy featuring comedian Rosie Jones and more guests tbc. SQIFF 2019 will close with the Scottish Premiere of White Rabbit. Recently single, Korean-born LA artist Sophia Lee – played by performance artist Vivian Bang (who also co-wrote the screenplay with director Daryl Wein) – devotes herself to her public performance art, whether it’s a provocative Korean perspective in the park on the LA Riots or quirky digital art on social media. To pay the bills, she does odd jobs for TaskRabbit. When a stranger makes Sophia late for a TaskRabbit gig, she loses her temper with her, only to run into her repeatedly and discover a strong connection. Sophia develops feelings for her, but it’s unclear if her love is reciprocated. Tickets for both events are priced on a sliding scale £0-£8 depending on what you can afford. BFI Comedy Genius is a nationwide season supported by funds from the National Lottery, led by Film Hub Midlands on behalf of the BFI UK Film Audience Network. QFN is a strategic Film Hub Wales project and receives support from the BFI Film Audience Network. We host an annual Festival of LGBTQ+ film things in Glasgow + one-off events throughout the year. SQIFF 2019 takes place 2nd to 6th October. Subscribe to our occasional e-newsletters. We promise never to share your contact details. © 2019 SQIFF. All Rights Reserved.